One of my ongoing concerns is the future strength, or lack thereof, of the U.S. Dollar. As I am gravely concerned over the future level of the U.S. Dollar and the implications of such, I have written extensively on the subject of the U.S. Dollar and its vulnerability to substantial decline. As I’ve discussed in previous posts, perhaps the main reason for the complacent attitude toward future U.S. Dollar levels is that the U.S. has never experienced substantial economic problems brought on by currency weakness. It appears as if many people will worry about a significantly lower U.S. Dollar if – and when – it occurs. There are many problems with this approach. Based on various fundamental and technical analysis factors, I believe that should the Dollar fall substantially from these levels – as I expect – the decline will prove rather intractable – i.e. once it falls, it will stay lower and “reversing the slide” will prove very difficult. A substantial Dollar decline will have many ill-effects, and will likely be akin to opening a “Pandora’s Box” of various economic and financial problems. This currency weakness will create an entirely new set of severe economic problems and challenges, in addition to other problems that will almost certainly coexist at the same time of the Dollar’s decline. While undoubtedly many people will expect any Dollar decline to be gradual and thus “manageable,” such an expectation will unfortunately prove too optimistic. This entry was posted in U.S. Dollar Commentary and tagged US Dollar on October 31, 2013 by Ted Kavadas. Lately there have been a variety of opinions and articles stating that the decline of the U.S. Dollar is either not something to be (unduly) concerned about, or even that such a falling U.S. Dollar will be beneficial. The logic behind these opinions is various. One, that is particularly notable, is that the U.S. Dollar has had large declines previous in its history; these declines have occurred with negligible adverse economic consequences. Based upon these previous Dollar declines, it follows that any large decline now will also be free of accompanying economic damage. This theory, that previous large Dollar declines have not had severe economic ramifications, is largely true; however, I believe, based upon a variety of factors that these previous episodes are not representative of our current economic situation. One of the reasons I believe that this U.S. currency decline is not being taken as seriously as it should is that the U.S., unlike other countries, has never experienced a severe decline in its currency that brought on severe adverse economic consequences. While of course such accompanying adverse economic consequences is contingent upon many factors, including the extent of the currency’s decline, on an “all things considered” basis I believe there are many reasons to be very concerned about further substantial U.S. Dollar weakness. Of particular concern is U.S. policy toward the U.S. Dollar, as stated by Treasury Secretary Geithner and Ben Bernanke. The “official policy” is one supportive of a “strong Dollar.” However, policy actions seem to contradict the “strong Dollar” statements. While a severe drop in the U.S. Dollar can hopefully somehow be avoided, I fear that this probability is low. As such, I have written extensively about the vulnerability of the U.S. Dollar to a substantial decline and the adverse economic consequences that would accompany such. We, as a nation, are already seeing the negative manifestations of a weak Dollar, many of which are causing complex problems. Further adverse impacts from a weak currency are bound to be just as insidious, if not more so. This entry was posted in U.S. Dollar Commentary and tagged US Dollar on May 4, 2011 by Ted Kavadas. I have written many posts concerning the vulnerability of the U.S. Dollar to a substantial decline, and the ill-effects such a decline would have on the U.S. economy and markets. Many people, especially those of the “hard money” and “Austrian” philosophies, have long held that many of the actions we (as a nation) have been taking to combat our current period of economic weakness would unduly pressure the dollar. These actions have included very low interest rates, truly outsized interventions (including “money printing”) and deficit spending. For many reasons I doubt that the 70.7 level reached in 2008 will serve as any type of significant technical support. Below the 70.7 level is obviously a “new frontier” with no obvious strong technical support. In essence, from a technical perspective the downside would appear rather open-ended. I have heard the widespread arguments that conclude a lower dollar as positive and beneficial to the U.S. economy. However, I think these arguments are largely based on the assumption that such a dollar decline would be “reasonable” (i.e. not a sudden decline of unexpected magnitude). However, in my (admittedly very unique) opinion, various technical and fundamental analyses support a substantial dollar decline. My analysis indicates that once the U.S. dollar (currently at 77.07) falls below the 70-area it would likely usher in a new trading environment that would not be supportive. Should a substantial U.S. dollar decline occur, as my analysis indicates, I think it will prove very detrimental to the U.S. economy and financial markets. Furthermore, it will prove very difficult to reverse. This entry was posted in U.S. Dollar Commentary and tagged US Dollar on March 25, 2011 by Ted Kavadas. On January 7, The Wall Street Journal conducted an interview of Alan Greenspan. This entry was posted in U.S. Dollar Commentary and tagged Alan Greenspan, US Dollar on February 3, 2011 by Ted Kavadas. As those familiar with this blog know, I am very concerned about the vulnerability of the U.S. Dollar to a substantial decline. I have written extensively about this situation. This entry was posted in U.S. Dollar Commentary and tagged Keynes, US Dollar on January 26, 2011 by Ted Kavadas. On November 12, Macroeconomic Advisers had a blog post from Larry Meyer that discussed monetary policy (focused on QE2) and the U.S. Dollar. While I don’t agree with various parts of this blog post, I nonetheless think it is noteworthy to see what a (very) prominent economic consulting firm has to say on the issue. How does the exchange rate affect monetary policy? How will the foreign backlash affect monetary policy going forward? We have not changed our firmly-held view that the FOMC has no dollar policy; it has no target for the dollar, just as it has no target for equity valuations. Dollar policy is the realm of the Treasury. The foreign backlash will not dissuade the Committee from pursuing what it sees as appropriate policy. For the most part, the dollar has two roles with respect to monetary policy: First, it is part of the transmission mechanism, part of how monetary policy affects the economy. Second, to the extent that the dollar moves independently of monetary policy, it is like any other variable: The FOMC takes actual and projected changes in exchange rates into account in its forecast and responds accordingly. There are two circumstances (discussed below) under which the dollar would take more of a center stage in FOMC deliberations: (i) a “free fall” in the dollar and (ii) a tighter and more intense link between the dollar and commodity prices in a context of a faster pass-through from commodity prices to long-term inflation expectations and core inflation. A Dollar Collapse: If the dollar were to go into “free fall” (we will know it when we see it), the FOMC would face an enormous challenge because that would be catastrophic for the U.S. and foreign economies alike. There would be chaos in financial markets around the world. This is a nightmare scenario for the Fed, but a tail risk. Here, we expect that the FOMC would have to be part of the policy response to stabilize the dollar. Free fall, however, is much more likely as a result of continued fiscal irresponsibility in the U.S. The Dollar-Commodities-Inflation Nexus: The FOMC likely worries about the recent seemingly more intense relationship between the dollar and commodity prices. The consequences depend on the degree to which commodity prices are passed through to core inflation. In any case, a sharp and persistent rise in commodity prices could raise concern about an unhinging of long-term inflation expectations, which, in turn, could affect monetary policy. Today, however, the main driver of rising commodity prices, we believe, is supply and demand, especially soaring demand by Asian economies. This entry was posted in U.S. Dollar Commentary and tagged Macroeconomic Advisers, US Dollar on November 15, 2010 by Ted Kavadas. In the November 25, 2009 post I commented upon how Ron Paul has repeatedly mentioned that the dollar has lost over 95% of its purchasing power since the founding of The Federal Reserve in 1913. This fact lacks recognition, as does its implications and consequences. Recently I came across a feature on the Minneapolis Federal Reserve site titled “What is a dollar worth?” This calculator is based upon CPI. This entry was posted in U.S. Dollar Commentary and tagged US Dollar on October 4, 2010 by Ted Kavadas. As “substantial decline” is somewhat open to interpretation, I would like to clarify what I meant. As one can see, the current price of 81.64 is approaching the technically significant 80-level. This level has served as technical support on a number of occasions. If that level is broken, there is not much precedence from a longer-term perspective. For many reasons I doubt that the 70.7 level reached in 2008 will serve as any type of significant technical support. Below the 70.7 level is obviously a “new frontier” with no obvious strong technical support. In essence, from a technical perspective the downside would appear rather open-ended. Additionally, I would like to address one comment I have repeatedly heard regarding the U.S. Dollar. Many people believe that the U.S. Dollar is (still) a “safe haven” as it has increased in price during The Financial Crisis of 2008-2009 as well as market turmoil during this year. As such, this purported continual “safe haven” status is supposed to support the idea that the U.S. Dollar is strong fundamentally. While I see the reasoning behind this logic, I don’t believe that this logic or interpretation of recent upward Dollar movements is correct. Many complex factors impact the price movements of the U.S. Dollar, and I wouldn’t assume that just because it has recently increased during periods of market stress that it will continue to do so. In summary, I continue to believe the U.S. Dollar is highly vulnerable to a substantial decline. This decline has the potential to be rather open-ended in nature, as supported by both technical and fundamental factors. Once the 70-level is broken, the U.S. Dollar decline would likely become very pernicious and levels of 50, as well as substantially below, should be considered possibilities. Should such a U.S. Dollar decline occurs, this currency weakness alone would create an entire new set of severe economic problems and challenges. This entry was posted in U.S. Dollar Commentary and tagged US Dollar on July 30, 2010 by Ted Kavadas. On December 17, I commented on the US Dollar, especially in the context of the US Dollar carry trade. I have also included a few trendlines shown in blue and red. As one can see, at the present price of 77.02, the USD is near the bottom of the price range of the last 10 years. So far, as can be seen on the chart, the US Dollar has “held in there”, most likely for a variety of reasons. 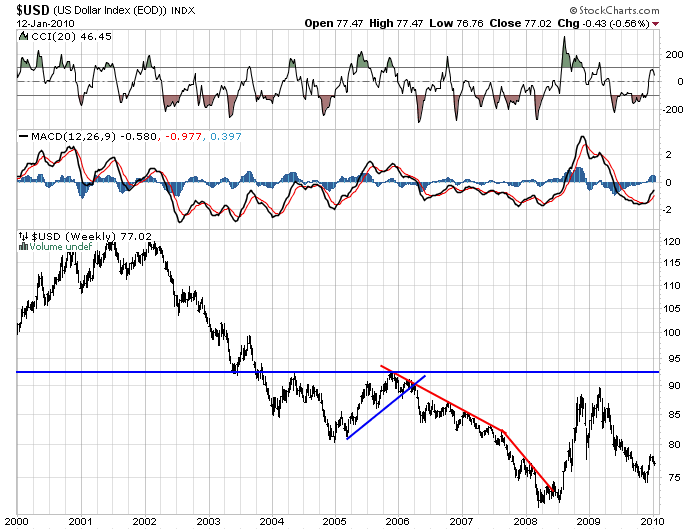 It should be very interesting to watch the US Dollar from here. Although there appears to be few, if any, signs that a severe US Dollar decline is impending, as stated above many of the actions we have been taking (and will most likely continue to take) are certainly cause for concern when viewed in context of US Dollar strength. The strength of the US Dollar is of paramount importance, because (of course) perhaps the fastest and most assured way of getting into severe economic trouble is to have rapid currency depreciation. This entry was posted in U.S. Dollar Commentary on January 13, 2010 by Ted Kavadas. One of the facts that Ron Paul frequently quotes is that since the Federal Reserve’s inception (it was created in 1913) the U.S. Dollar has lost more than 95% of its purchasing power. I wonder how many people are actually concerned by this occurrence? I hardly ever hear this discussed among people or by the media. This entry was posted in U.S. Dollar Commentary and tagged Ron Paul, US Dollar on November 25, 2009 by Ted Kavadas.